Optimizing resources: segmentation as a strategy you use to concentrate, and thus optimize your resources within a overall market. 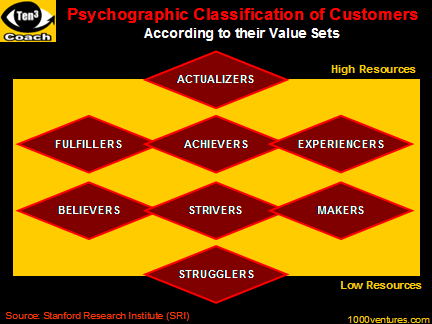 Understanding customer needs: segmentation as the group of techniques you use as a vendor to segment your target market to develop insights into customer needs. Successful marketers qualify their current and prospective customers. By doing so, they can better target their value propositions to different customer groups, which results in higher sales. Innovative segmentation and resegmentation of your target market is the starting point of your sustainable profitable growth. Any market is the sum of many segments. Each segment fulfills a need, and these needs are constantly changing. There are many ways to segment a market. You can resegment a market by consumer age, → culture, motivation and buying behavior, customer value sets, value proposition, technology, price points, distribution channels, line extensions, and the like. You can also define a new segment, i.e. define a customer need that nobody else has thought of or addressed before. Besides, segmentations is not once and for all, it's a dynamic, ongoing exercise and state of mind. When you break your market down into segments, you've got a powerful methodology for developing insights into customer needs and generating growth ideas. Think expansively, observe people, learn everything you can about customers' needs, including those that the customers haven't yet identified. Think outside-the-box to generate market stretching concepts that will change the name of the game. Invented in 2001, → Ten3 Business e-Coach has customers all around the World and licensed trainers in 50+ countries.